Tree planting is just one of the many services Kable Landscaping offers to help your home or business make a great impression. 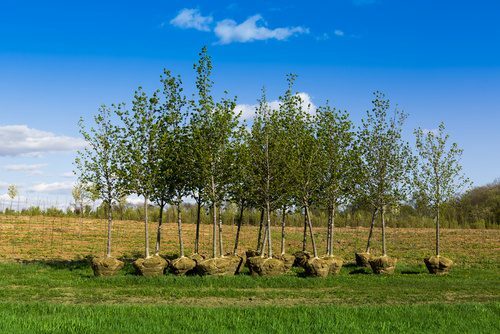 Our tree planting expertise provides the perfect, personalized touch you’re looking for when choosing the ideal tree options for your landscape design. We’ll help you choose the perfect trees for your outdoor space – and do all the heavy lifting! At Kable Landscaping, we provide a client-focused experience that helps us make your vision a reality. Which Trees are Right for You? Tree planting isn’t as simple as digging a hole and placing a sapling in the ground to grow. Some trees do well in shaded areas, while some need full sunlight. Some trees can withstand drier weather, while others need heavy hydration. Know the conditions your trees will have to contend with, as well as your ability to attend to those needs before you make a purchase. Unsure what trees will work best for your outdoor space? Call on Kable Landscaping to provide honest answers. Just like any plant, trees need proper sunlight, depending on the type, in order to grow to their full potential. When selecting a planting space, make sure there is appropriate sunlight for the species. Kable Landscaping has the knowledge and expertise to recommend the ideal trees to plant in your outdoor spaces. After the tree is planted, make sure to supply the berm basin – the area encompassing the tree’s root ball – with sufficient water. Each species of tree requires different levels of hydration. Refer to the care instructions provided by your nursery or call on the experts at Kable Landscaping for sound advice. When a tree is planted, the natural elements – like rain and heavy winds – could cause it to lean slightly and grow at an angle. In order to prevent this from happening, make sure you’ve tied the tree to parallel posts on either side of the natural cross-wind, allowing for stability during the tree’s initial growth period. Are you ready to talk to Kable Landscaping about tree planting options for your home or business? Call us today at (989) 695-5222. We look forward to hearing from you!